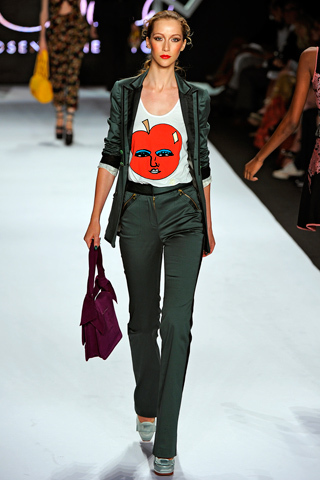 Nirvana’s « Smells Like Teen Spirit » song inspired the slogan on a dress of the Jean-Charles de Castelbajac Autumn/Winter 2008-2009 Show. Other Kurt Cobain-inspired or Nirvana-inspired collections or items : Charles Anastase Autumn/Winter 2009-2010 (collection influenced by Kurt Cobain’s spirit and Arthur Rimbaud), Converse (« Kurt Cobain » sneakers were launched, for Spring/Summer 2008, to celebrate Converse’s 100th anniversary), Dior Homme by Hedi Slimane Spring/Summer 2005 Menswear (grunge influences), Felder Felder Autumn/Winter 2008-2009 (grunge-inspired collection), Freda Autumn/Winter 2010-2011 (the cashmere sweaters were inspired by Kurt Cobain), Kristina Ti Autumn/Winter 2012-2013 (this collection, more specifically inspired by Frances Bean Cobain, revisits grunge), Number (N)ine Spring/Summer 2007 Menswear (the starting point of this collection was a mix of Kurt Cobain and Johnny Cash), Perry Ellis by Marc Jacobs Spring/Summer 1993 (grunge-inspired collection), Preen Autumn/Winter 2008-2009 (Kurt Cobain’s grunge), Vladimir Karaleev Autumn/Winter 2011-2012 (wool clothes influenced by Nirvana’s « Unplugged » album). Moreover, the picture of Kurt Cobain with a tinsel was one of the inspirations of the Rachel Feinstein’s stage design for the Marc Jacobs Autumn/Winter 2012-2013 Show. 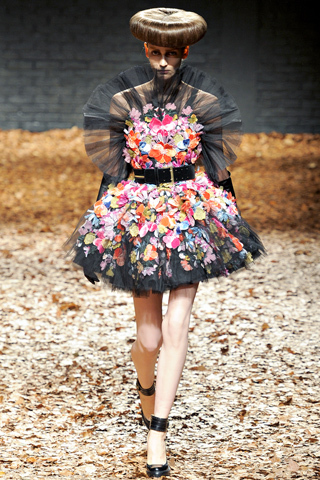 Several dresses of the McQ from Alexander McQueen by Sarah Burton Autumn/Winter 2012-2013 Show sourced their inspiration from flowers. Other collections with flowers : Alexander McQueen Spring/Summer 2007 (the silk dress of the finale of this « Sarabande » collection was covered with real flowers, such as hydrangeas, peonies and fresh roses), Cacharel (the Liberty print is Cacharel’ DNA and is present in numerous collections of the brand), Chanel (the camellia, which made its 1st official appearance in the Chanel collections in the 30s, was Coco Chanel’s fetish flower), Christian Dior (at the end of the 40s, Christian Dior, launched the « Lily of the Valley », his fetish flower, and « Tulip » lines, with floral prints ; Raf Simons paid tribute to Christian Dior’s love of flowers, a passion that he shares, by presenting the Dior Couture Autumn/Winter 2012-2013 Show in salons with walls covered with delphiniums, mimosas and orchids), Christian Lacroix (from 1987 to 2009, all his couture collections featured flowers), Gucci by Frida Giannini Autumn/Winter 2004-2005 (accessories line, re-issuing the « Flora » print, originally created in 1966 for Princess Grace of Monaco, after a Vittorio Accornero’s painting), Kenzo (since the 70s, flower-prints have been so essential for the brand’s designs that the 1st reviews of Kenzo Takada’s collections mentioned some « flower-dresses »), Jean Paul Gaultier Spring/Summer 2011 (3-D floral prints), Léonard (since the 60s, Daniel Tribouillard has supervised the handmade floral prints that are present in all the brand’s collections), Viktor & Rolf Spring/Summer 2005 (this collection was dedicated to their « Flowerbomb » perfume, launched in 2005). The Jean Paul Gaultier Spring/Summer 2012 Show was a tribute to tattoos. Other collections with tattoos : Celine by Ivana Omazic Spring/Summer 2009 (Polynesian-tattoo motifs), Costello Tagliapietra Spring/Summer 2009 (anchor tattoos), Dior Spring/Summer 2004 (tattoo motifs on leotards and stockings), Ed Hardy (since 2004, this brand designs accessories and clothes which are based on Don Ed Hardy’s tattoos), Elsa Schiaparelli (she was the first designer who created tattoo prints that were inspired by the sailors’ tattoos), Givenchy by Riccardo Tisci Spring/Summer 2007 (tattoo prints influenced by tribal paintings), Gucci by Frida Giannini Resort 2009 (rose tattoo motifs), Jean Paul Gaultier Spring/Summer 1994 (« Les Tatouages / The Tattoos »), Julien Macdonald Spring/Summer 2012 (dragon tattoo motifs), Puma by Alexander McQueen Autumn/Winter 2006-2007 (the Maori tattoos inspired the sneakers of this line). Catwoman inspired the feline ears of the Iceberg Autumn/Winter 2008-2009 Show. Other Catwoman-influenced collections or items : Altuzarra Autumn/Winter 2010-2011 (Catwoman-inspired outfit), Catherine Malandrino Autumn/Winter 2012-2013 (the story of this show, a woman who turns into a cat, was more specifically inspired by Paul Schrader’s « Cat People »), Christian Louboutin (in December 2009, Christian Louboutin designed a Barbie doll dressed in a Catwoman-inspired bodysuit), Givenchy by Riccardo Tisci Autumn/Winter 2011-2012 (the feline inspiration of this collection was more specifically influenced by Roxy Music’s « For Your Pleasure » album sleeve), Katy Perry (the bottle of her fragrance, « Purr », launched in 2010, is inspired in part by Catwoman’s outfit), PPQ Autumn/Winter 2011-2012 (hats with cat ears), Wolford Autumn/Winter 2004-2005 (« Wolford Look » line based on Pitof’s « Catwoman »). Moreover, to celebrate the release of Pitof’s « Catwoman », Henri Bendel asked designers (C&C California, Constanca Basto, FAL Jeffrey Grubb, Isabella Fiore and Juicy Couture) to create Catwoman-inspired accessories and clothes, that were sold from July 5, 2004, at Henri Bendel, New York.